Look down below! Photo by Lawrence LaRose. A family ventures into the woods, and discovers more nature, vistas, and stunning gorges. 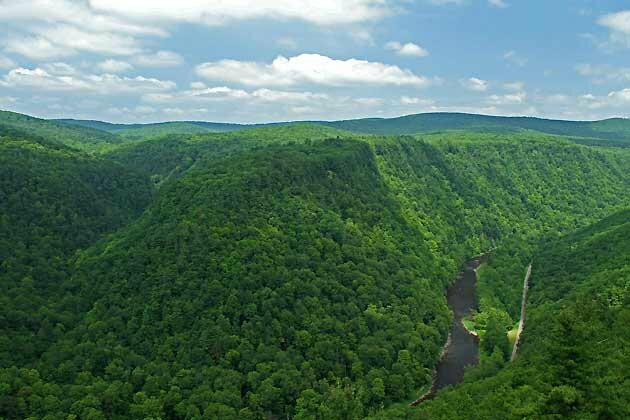 TIOGA STATE PARK, Pennsylvania – I hate the word breathtaking. Maybe a punch to the gut or landing on the moon without your space suit is breathtaking. Places do not qualify. That said, I was in awe — and totally surprised — when I saw the Grand Canyon...in Pennsylvania. (Of all places.) Located roughly 225 miles northwest of New York City, or 200 miles northeast of Pittsburgh, the Grand Canyon is in the . Nearly forty-five miles long and up to fifteen hundred feet deep, it is, well, grand. Needless to say, this damage didn’t go totally unnoticed, and a writer named George Washington Sears, considered one of the earliest conservationists, wrote impassioned poems about the ravages of industry on the environment. He was also a sportswriter for Forest and Stream magazine, where he wrote about canoeing on your own and ultralight camping. This was revolutionary stuff at the time, and that’s what interested us, which is to say me, my wife, and our two young sons. After climbing a vertigo-inducing lookout tower and catching our breath at the rim of the gorge, we got down to the river’s edge and rented boats. The water was a bit low in July, but a wonderful adventure nonetheless. The easy spot to “drop in” (that’s canoist lingo) is Ansonia and “take out,” seventeen miles later, is Blackwell. Rapids can approach class three (of six), so we had some bouncy (and safe) whitewater fun for the whole family — as well as spectacular sightseeing. We hiked along the short Barbour Rock trail, but if you're feeling intrepid, there are longer options like West Rim Trail and Pine Creek Trail, which includes a long flat stretch along the former railway bed. Other invigorating outdoor activities including fishing for large brown trout, smallmouth bass, and walleyes, and taking a guided raft tour (lunch provided). But wait, there's more! Hiking, trail biking, golf, horseback riding, motorcycle tours, skiing and snowmobiling in winter. Less sweaty stops include (which is, I kid you not, fascinating) and a ride on the (excellent for vintage train buffs). You can camp in several locations, or stay at one of in the Wellsboro area. If you happen to be visiting on Memorial Day weekend, you can really get your Americana on at . You come to celebrate coal and end up entering your child in the cutest baby contest. Just think of the stories you'll live to tell. Lawrence is an , writer, builder, father, husband and (thereby) champion schlepper. He travels for the awesome.